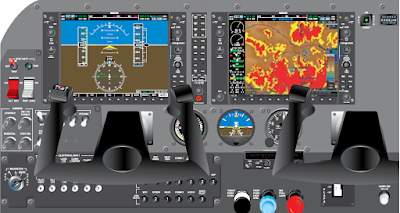 Three of the most common flight instruments, the attitude indicator, heading indicator, and turn needle of the turn-andbank indicator, are controlled by gyroscopes. 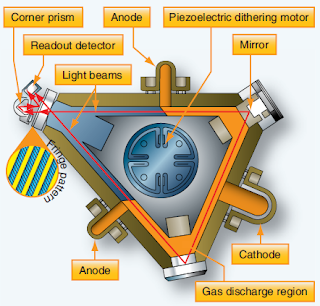 To understand how these instruments operate, knowledge of gyroscopic principles and instrument power systems is required. The supporting ring can also be mounted inside an outer ring. The bearing points are the same as the bracket just described, 90° around the supporting ring from where the spin axle attached. Attachment of a bracket to this outer ring allows the rotor to rotate in two planes while spinning. Both of these are perpendicular to the spin axis of the rotor. The plane that the rotor spins in due to its rotation about its axle is not counted as a plane of rotation. A gyroscope with this configuration, two rings plus the mounting bracket, is said to be a free gyro because it is free to rotate about two axes that are both perpendicular to the rotor’s spin axis. [Figure 1D] As a result, the supporting ring with spinning gyro mounted inside is free to turn 360° inside the outer ring. Weight—for a given size, a heavy mass is more resistant to disturbing forces than a light mass. Angular velocity—the higher the rotational speed, the greater the rigidity or resistance is to deflection. Radius at which the weight is concentrated— maximum effect is obtained from a mass when its principal weight is concentrated near the rim, rotating at high speed. 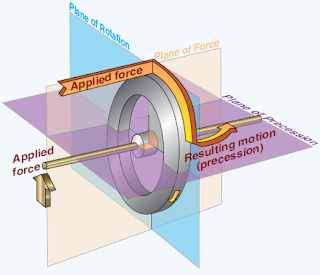 Bearing friction—any friction applies a deflecting force to a gyro. Minimum bearing friction keeps deflecting forces at a minimum. This characteristic of gyros to remain rigid in space is exploited in the attitude-indicating instruments and the directional indicators that use gyros. 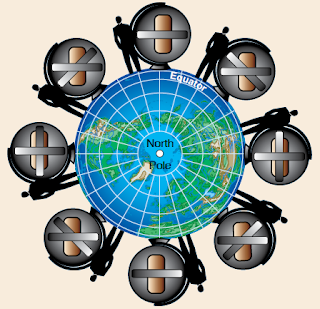 Precession is a second important characteristic of gyroscopes. By applying a force to the horizontal axis of the gyro, a unique phenomenon occurs. The applied force is resisted. Instead of responding to the force by moving about the horizontal axis, the gyro moves in response about its vertical axis. Stated another way, an applied force to the axis of the spinning gyro does not cause the axis to tilt. Rather, the gyro responds as though the force was applied 90° around in the direction of rotation of the gyro rotor. The gyro rotates rather than tilts. [Figure 3] This predictable controlled precession of a gyroscope is utilized in a turn and bank instrument. Improved attitude and direction information is always a goal in aviation. Modern aircraft make use of highly accurate solidstate attitude and directional devices with no moving parts. This results in very high reliability and low maintenance. The ring laser gyro (RLG) is widely used in commercial aviation. The basis for RLG operation is that it takes time for light to travel around a stationary, nonrotating circular path. Light takes longer to complete the journey if the path is rotating in the same direction as the light is traveling. And, it takes less time for the light to complete the loop if the path is rotating in the direction opposite to that of the light. 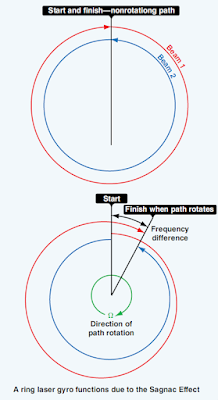 Essentially, the path is made longer or shorter by the rotation of the path. [Figure 4] This is known as the Sagnac effect. Light traveling in opposite directions around a nonrotating path arrives at the end of the loop at the same time (top). 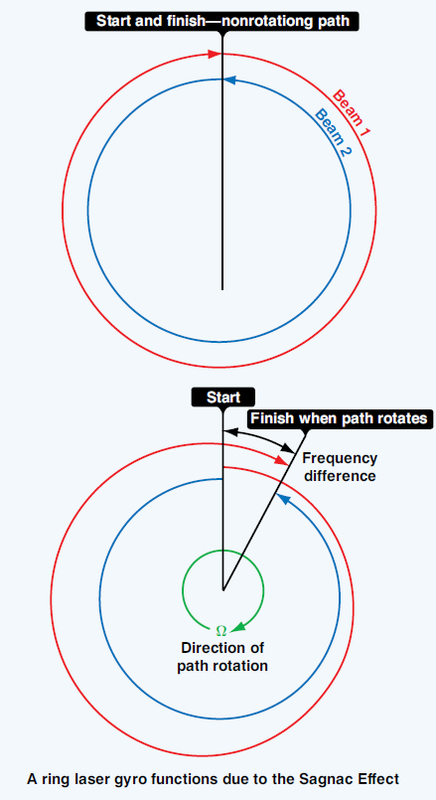 When the path rotates, light traveling with the rotation must travel farther to complete one loop. Light traveling against the rotation completes the loop sooner (bottom). A laser is light amplification by stimulated emission of radiation. A laser operates by exciting atoms in plasma to release electromagnetic energy, or photons. A ring laser gyro produces laser beams that travel in opposite directions around a closed triangular cavity. The wavelength of the light traveling around the loop is fixed. As the loop rotates, the path the lasers must travel lengthens or shortens. The light wavelengths compress or expand to complete travel around the loop as the loop changes its effective length. As the wavelengths change, the frequencies also change. An RLG is remotely mounted so the cavity path rotates around one of the axes of flight. 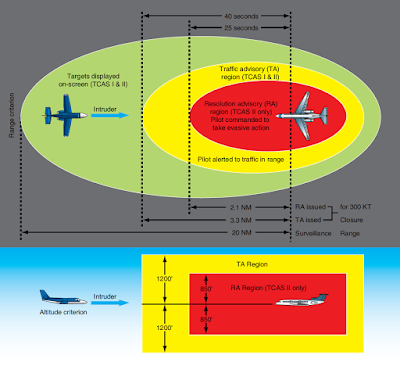 The rate of frequency phase shift detected between the counterrotating lasers is proportional to the rate that the aircraft is moving about that axis. On aircraft, an RLG is installed for each axis of flight. Output can be used in analog instrumentation and autopilot systems. It is also easily made compatible for use by digital display computers and for digital autopilot computers. RLGs are very rugged and have a long service life with virtually no maintenance due to their lack of moving parts. They measure movement about an axis extremely quickly and provide continuous output. They are extremely accurate and generally are considered superior to mechanical gyroscopes. On aircraft, microelectromechanical systems (MEMS) devices save space and weight. Through the use of solid-state MEMS devices, reliability is increased primarily due to the lack of moving parts. 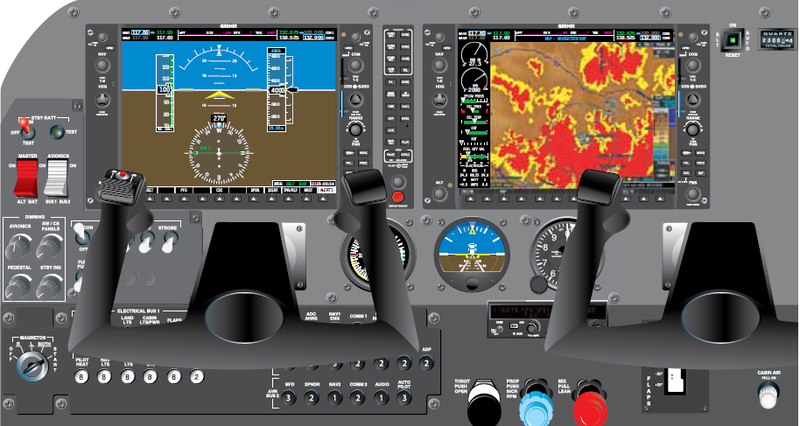 The development of MEMS technology for use in aviation instrumentation integrates with the use of ADCs. This newest improvement in technology is low cost and promises to proliferate through all forms of aviation. MEMS for gyroscopic applications are used in small, general aviation aircraft, as well as larger commercial aircraft. Tiny vibration-based units with resistance and capacitance measuring pick-offs are accurate and reliable and only a few millimeters in length and width. 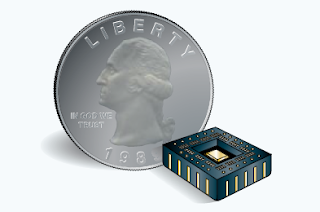 They are normally integrated into a complete micro-electronic solid-state chip designed to yield an output after various conditioning processes are performed. The chips, which are analogous to tiny circuit boards, can be packaged for installation inside a dedicated computer or module that is installed on the aircraft.